2008: Western Creek on a Gunns plantation. Those of us watching the spraying from the road could also feel the spray drift hitting us as the wind was from the South and blew the spray drift onto my friends Organic farmland. We actually had the representative from the Department of Primary Industries overspray unit there watching with us. He did not think it was a problem or think that spray drift was leaving the plantation. The cleared land in the foreground is the organic farm property. 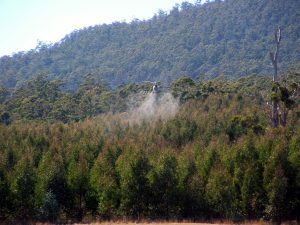 This entry was posted in Human health, Photos, Spray Drift on December 4, 2016 by Anthony.